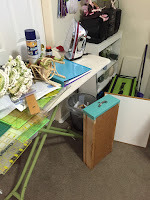 Every good artist or quilter gets to this stage sooner or later. 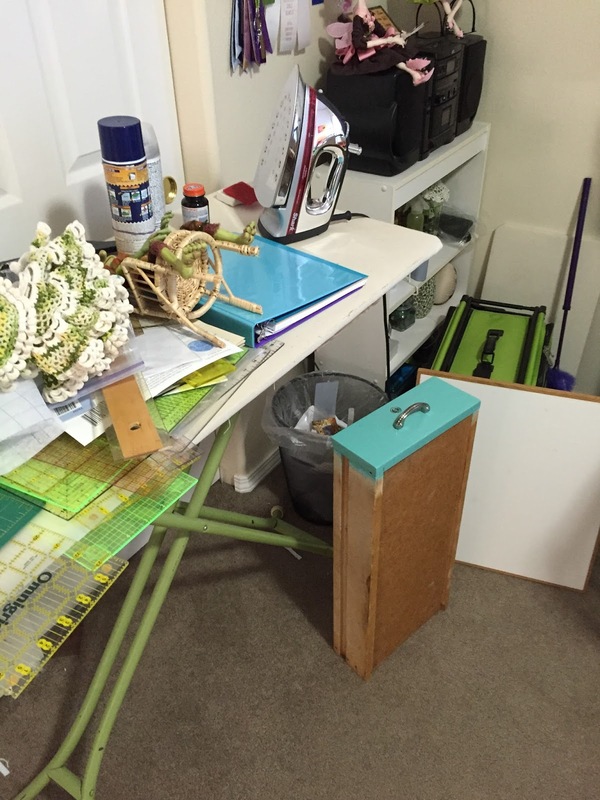 Organizing the studio space! It's not like I have nothing else to do. But the weather has finally cooperated, we're home for a 3 week stretch, and I still have the unfinished spring cleaning check list staring at me from the bulletin board. 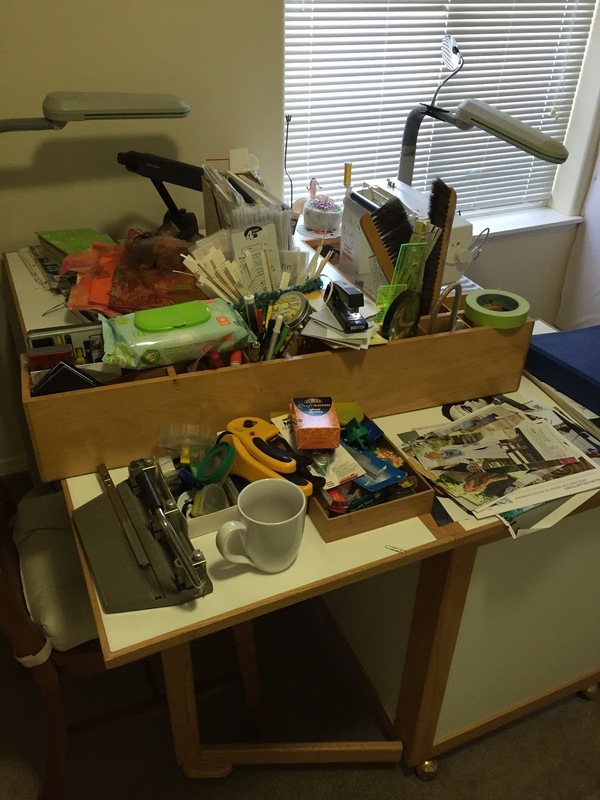 Well, getting organized is all about getting rid of clutter, so you have to haul it out to get it sorted out. What you see in these photos is mostly the stuff that was stored inside the drafting table, and underneath it. Some of it has to get donated or tossed. Want some of it? Earlier this year, I went through the book, "The Artist's Way" by Julia Cameron with a group of other fiber artists. 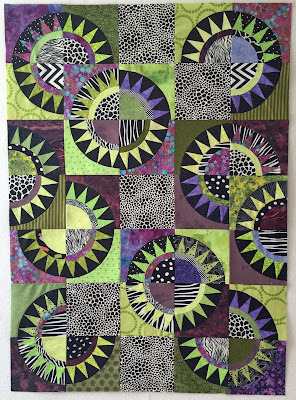 This really strengthened my resolve to become more of an artist than a quilter. 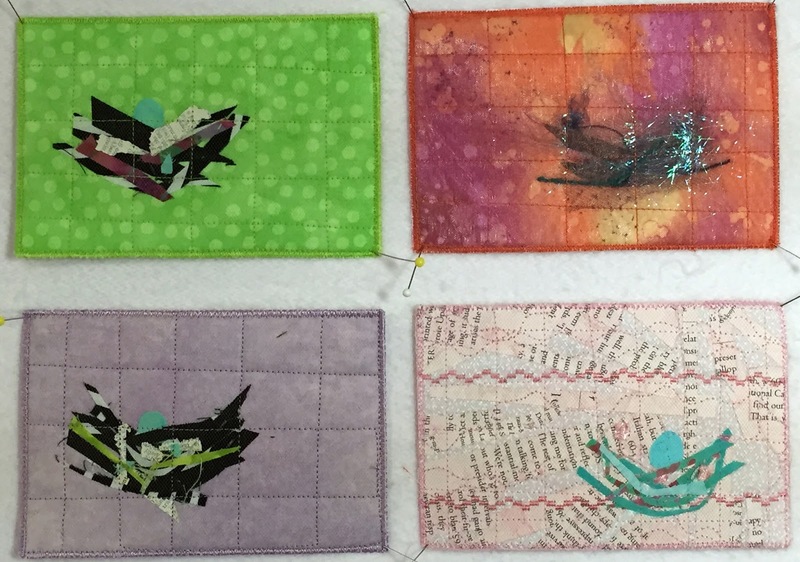 I told the group that I wanted to make and exhibit my Nest art quilts. Synchronicity was one of the themes of the book, and my basic take on it is that whatever you're seeking will happen. And if you stay aware, when opportunities present themselves, you notice and take action. A few weeks ago, I saw a call for artists in our local paper. One of the local galleries was seeking artists for a show entitled, "Texture". Whoa! I knew that I had to submit some nest pieces to the jury for this show. And I got in! I'm so excited and can't wait for the show and the artist's reception. I hope your dreams also come true. Anyway, I had to come up with a hanging system that is different than the 4" sleeve required for quilt shows, and I found a great start on Pinterest. I used 3/8" x 2-1/2" pine boards, 13/16" eye screws, and fishing line. 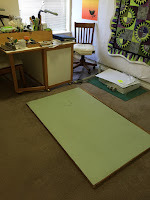 I cut the board to the same length as my sleeves, which were already sewn on to the back of the art quilts. Then I screwed in the eye screws in the center of the boards. After I slipped the boards into the sleeves, I attached the fishing line with several knots on both ends. 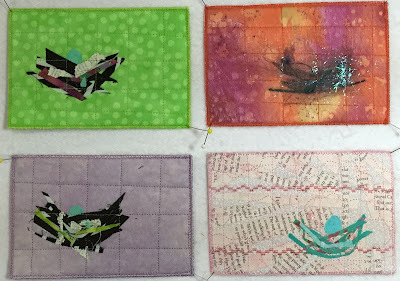 Now the art quilts can be hung on regular picture hangers or picture nails and the hanging system doesn't show from the front side. It's summertime and it's been gloriously hot and dry this year. I want to be outside in the garden, or on my bicycle, or hiking, or camping. 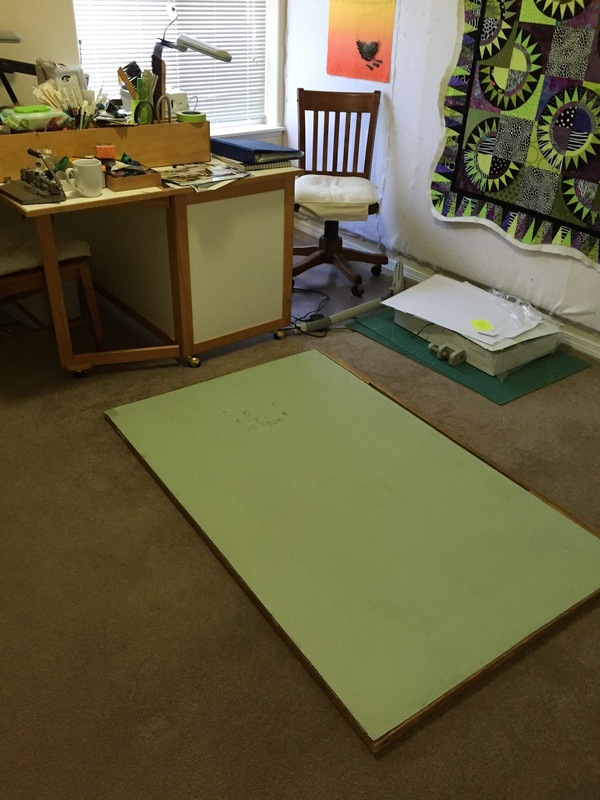 Anything but sitting in my quilt studio, which just doesn't appeal to me this time of year. 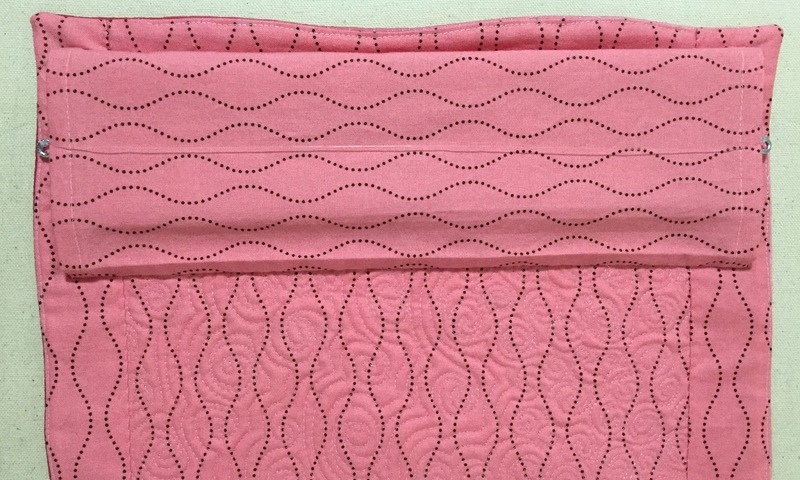 But that doesn't mean I stop thinking about my next quilt (or the next 5!). How about you? Do you get the itch to be outside too? 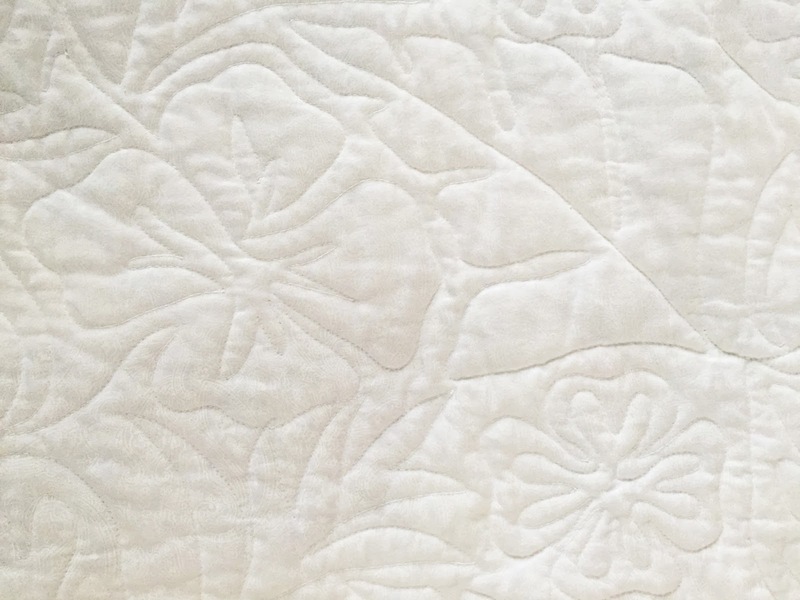 I have a friend who makes a lot of charity quilts, and even though she started in 2012, she's already made over 75 quilts! Needless to say, she keeps on working through her summer. What an inspiration. Not for just working through the summer, but for thinking about the needs in our community. I also make quilts for charity, but my efforts pale compared to hers. 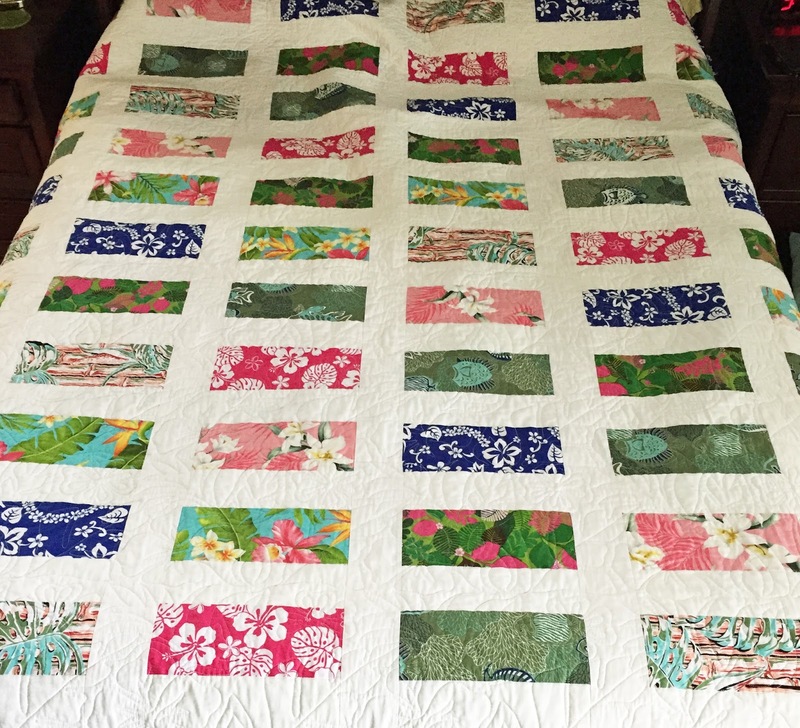 Recently, I had a lot of fun making quilts with Hawaiian print fabrics (from a trip to Hawaii) and white-on-white prints (that I inherited from my mother). 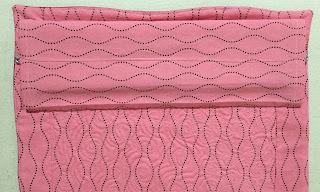 When the charity group from my quilt guild found out that I was interested in making some for charity, they gave me a big stack of fabric to use for the backing. My sister helped me sew the tops, and we turned in some fun tropical quilts to our charity group. Here is a picture of the large quilt that was the inspiration for the 4 smaller ones. 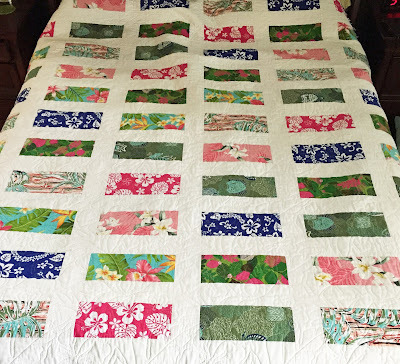 This is a super easy quilt to make and really shows off the large prints. I got into one of those cleaning moods and went through some of my old boxes with samples from quilt classes that I had taught. One of the boxes had an old New York Beauty sample with a lot of pieces already cut out. I taught this class many times and still really enjoy foundation paper piecing. So, I decided to use up the sample pieces and add some new fabric in with the old. My favorite color is lime green and all of its shades. Needless to say, I have a lot of green fabric in my stash! Do you have a favorite color too? Perhaps a favorite fabric designer? 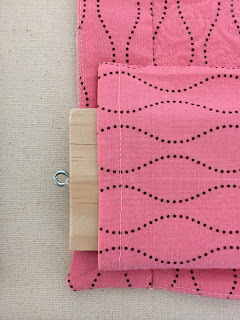 Maybe you have a favorite motif - like dots, cats, or hearts? 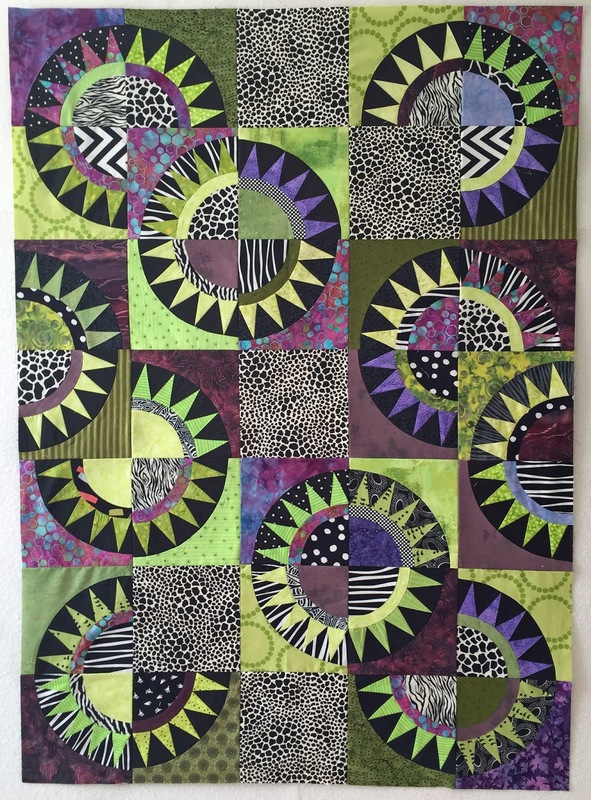 This New York Beauty quilt uses some of that lime green stash and is combined with its complimentary color of reddish-purple. To give it some punch, it's kicked up with black and white prints. 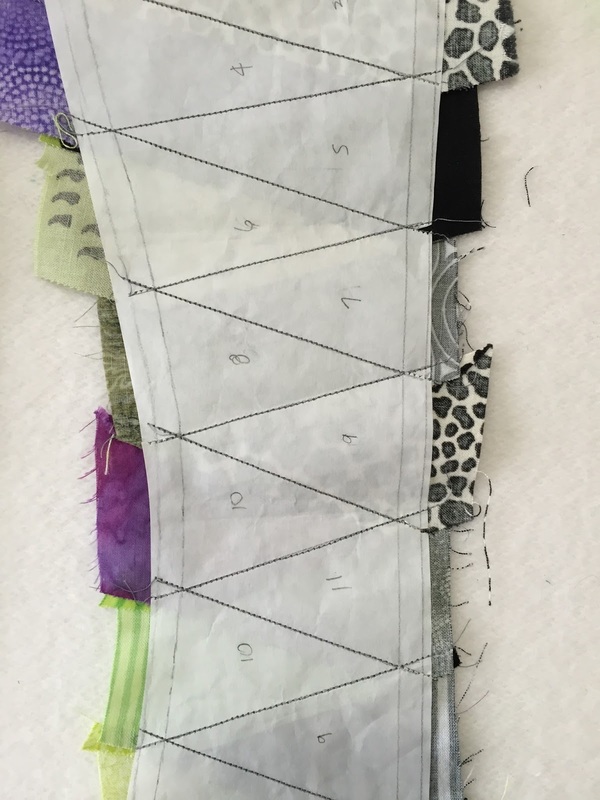 Here are the blocks sewn together to show the variety of fabrics. If you look closely, you'll see that I trimmed the blocks slightly wonky to give it a more modern appeal. The old method that I taught was too exacting, but right for the times. Now, we all want to just go with the flow and be spontaneous. 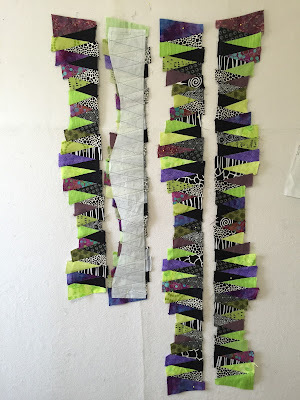 Here are the border pieces that are sewn, but not trimmed to size yet. 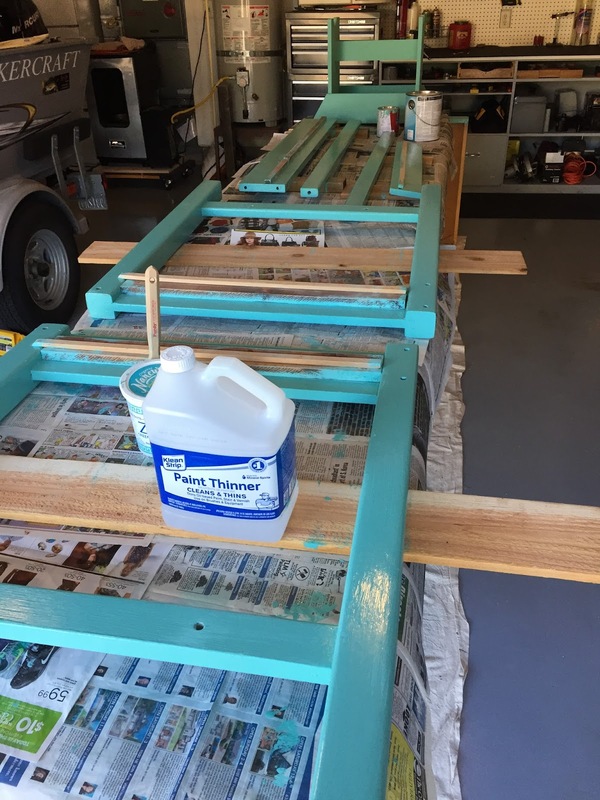 So many people have thought up great techniques to make foundation piecing easier. I especially like the techniques of Judy Niemeyer and Karen Stone. Check out their fabulous books and patterns. And take a class if you can! My favorite thing to do is to make pattern pieces that are 1/2" larger than the foundation area, and use these to precut my fabrics. This way, I can get the stripes or motifs just the way I want them, I don't waste fabric, and I always have a piece that is large enough to cover the foundation. 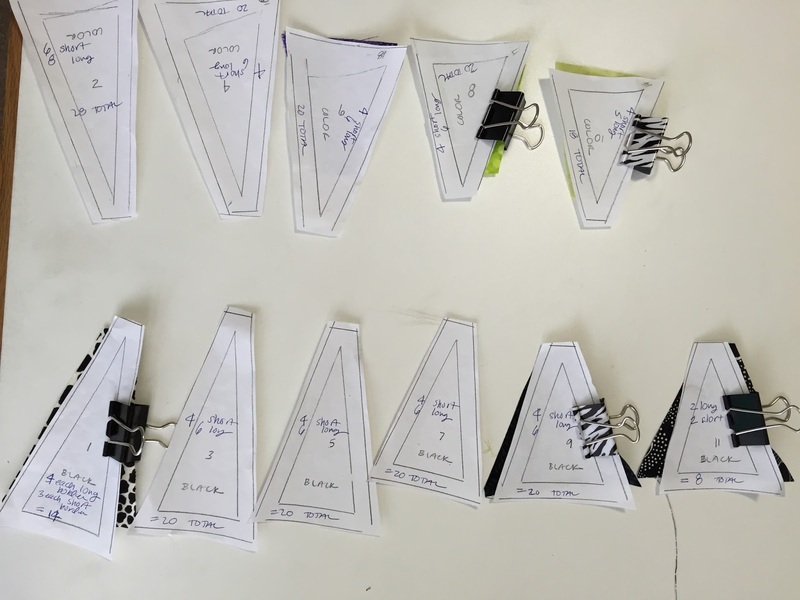 I lay out the precut fabric pieces with the pattern on top and clip the side that will be the side that is sewn. Then, its super easy to pick up the piece and sew it on correctly. The border strips for this quilt were all sewn with this method on strips of freezer paper where I had drawn the foundation pattern and numbered each piece.